Great, so you want free swag and those grown-up feels of adding #spo to a post? Welcome aboard! I’ve been thinking a lot about Influencer Marketing lately for a few reasons. One, I run Social Media for national brands, so I usually always have an influencer campaign running. Two, I’ve been jotting down talking points for the Influencer Marketing panel I’m on this March at Social Media Marketing World in San Diego. And three, I see the pros AND cons of how businesses run social campaigns, plus how influencers reach out to work with the brands I manage. Influencers have become a part of many businesses, and with influencer agencies popping up all over the place, it’s hard not to use influencers to promote events, products, destinations, etc. It’s a cheap form of marketing, and it’s an easy way to generate content for brands and scale brand awareness. I can easily write about what TO DO as an influencer, but I thought a WHAT NOT TO DO post would be more fun to write and albeit read. DM a brand and say “Hey, I saw you’re working with other accounts. Let’s collab!” NO! I work with an agency to manage the plethora of influencers we work with to allow us to scale. I used to manage all the influencers myself, but it ended up sucking so much of my time with all the back and forth, individual contracts, requests and shipping info, that I moved towards an agency with its own massive network. If you want to be an influencer you need to keep in mind that people are busy, so unless you express what you have to offer, how you’ll make the company amazing content (sales don’t hurt! ), provide exposure for the brand and are consistent in posting – then please don’t reach out… first build your network and brand to show value. DM a brand for their email address and then email them a week later or not at all. NO! If you’re not ready to jump on the train, don’t buy the ticket. Nothing looks more unprofessional than hitting people up in DMs and not following up with them if they responded. Try your hardest to make sure every post is #sponsored. NO! I personally don’t like to work with accounts who are only working with other brands. It shows that they say yes to everything, rather than hone in on what they really like and what would be most helpful and natural for their audience. This means that you should focus on you, your storytelling and building your community rather than post product after product. Take the same type of selfie/fashion photo. NO! This shows that you are not versatile, that you don’t try anything new, that you’re not creative. How will you create useful content for others? In the past, when I have worked with accounts like this I’m always disappointed with the content. Why? Because 99% of the time these types of accounts don’t know how to style something that they can’t wear, leaving me with content I can’t share due to the poor aesthetic and quality. Also, the comments on these OOTD posts are always about a blouse or shoes VS the product I sent them to promote. So, try more versatile shots, learn how to shoot product VS standard OOTD shots. Ok, rant over. Any thoughts or questions about Influencer Marketing? P.S. 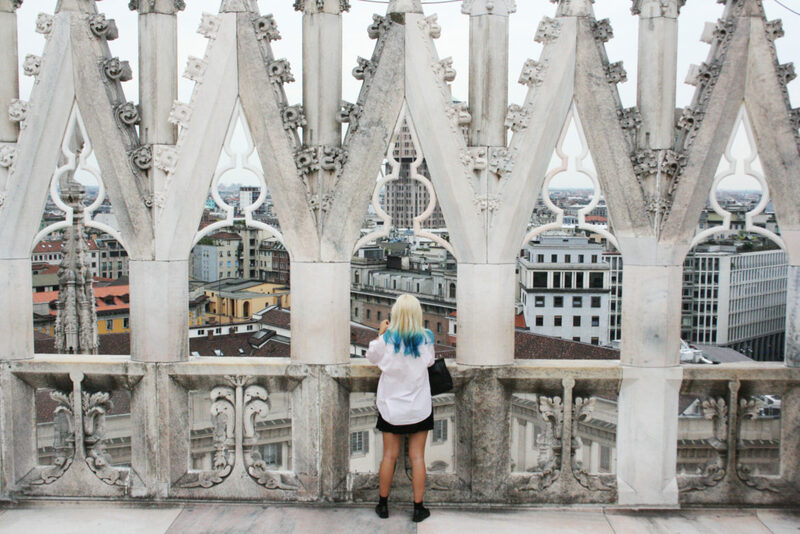 I took the photo in this blog post on top of the Duomo in Milan – of an Italian friend of mine @andykate. Her hair isn’t blue anymore, but she’s still just as cool. Great advice. I remember yours was one of the first accounts I followed while living in Bologna. I loved all the Instagram meet-ups you did. In Italy. Your photography was amazing. Can’t believe we are now both back stateside and Instagram has just exploded now.